Anyone who likes their terror served up with a healthy dose of wry humor will enjoy Draculas – a tasty concoction cooked up by four well-known masters of horror faire. Joe Konrath (aka Jack Kilborn), Blake Crouch, Jeff Strand and F.Paul Wilson decided to team up to produce this tale in time for Halloween. Mortimer Moorecook is rich, but money can’t buy immortality- especially when he’s been diagnosed with terminal cancer. So he purchases an ancient Romanian “Dracula” skull in the hope that a self-inflicted wound from the ex-vampire will somehow convey new life. Instead, the moment he lands in the emergency room of Blessed Crucifixion Hospital, he begins to morph into a real vampire. As he bites each victim in his lust for blood, he spreads his “infection”, so that soon the hospital is overrun with these creatures. And no one is immune- not Benny the Clown, the medical director of the ER, pregnant women or even “innocent” children. The technique of telling the story from many different characters’ points of view allowed the collaborators to produce a relatively seamless novel. Having read at least one of each of the authors’ previous works, it was not easy to tell who wrote which scenes. Only in the interview accompanying the e-version was ownership of specific characters revealed. For example, F. Paul Wilson admitted to Clay Theel, the “gun-nut cop” who spends his free time at gun shows and who is thrilled to be able to “demo” the new pieces he’s acquired on the blood-thirsty monsters. His favorite, “Alice”, the nickel-plated Taurus Raging Bull .454 Casull revolver could take down a cape buffalo. He’s sure it can blow away a “Dracula”. Joe developed the not-so-funny Benny the Clown; Blake came up with Oasis. 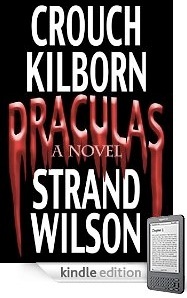 The writing team is introducing Dracula in Kindle format. This gets the book out to readers faster than the usual 18 month lead time for print. And just in time for Halloween.